After completing prayer and puja at the temple a visit to Mharme Lha Khang Gomba, the monastery dedicated to Guru Rimpoche (Padmasambhava) with his huge image situated to the North of Muktinath Temple. 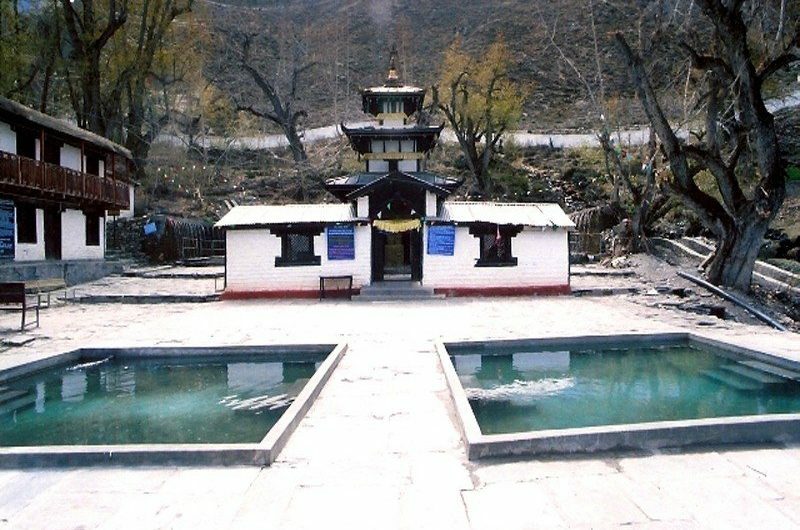 Jwalamai Temple: Continuously burning flame “Jwala Mai Temple” sound of flowing river is situated south of Muktinath Temple. The Jwala Mai temple has a spring and there are three eternal flames “Holy flame from soil”, “Holy flame from rock” and “Holy flame from water” fed by natural gas. Currently two flames are continuously burning. Hindu believes that this miracle of fire lighting was offering made by Brahma, Hindus worship the fire as Jwala Mai (Lit. Goddess of fire). The Buddhist called Dhola Mebar. Gomba Samba, a newly built monastery with main deities Sakyamuni, Chingresig and Guru Rimpoche situated at left from entrance gate of Muktinath temple complex, would be worth it. This is the only place on earth where you can find all five elements from which everything is made, according to the Buddhist and Hindu tradition: fire, water, sky, earth and air at the same place together in their own and distinct from this place is near Jwala Devi temple. According to Sri Vaishnava philosophy it is considered to be one of the Divya desam (108 in total) or holy places of worship of Lord Vishnu praised by Alwars in a compilation called the Nalayira Divya Prabandha.It is said that one has to be gifted to get the darshan of Lord Sri Murthi and Goddess Sri Devi Thayaar. The Buddhist nuns take care of cultural heritage inside Muktinath temple. A local Nun manages the pujas in the temple. Pilgrims who go there should offer prasad to the deity. The entire river bed has Shaligram stones which are used to worship Lord Vishnu. Photography and filming of deities inside Temple and Monasteries is strictly prohibited. This place is opened throughout the year but especially in Rishitarpani, Ram Nawami, and Bijay Dashami thousands of pilgrims gather here to celebrate the festival.The most suitable time to visit Muktinath is from March to June, and September to November as the weather conditions would not be safe enough to travel in other months. The journey passes through many archeological sites and temples. Thirumangai Alvar could not reach Muktinath, but had sung from nearest place in praise of Lord Sri Murthy. Periyalvar sung in praise of Sri Murthi as “Salagramamudaiya Nambi”. 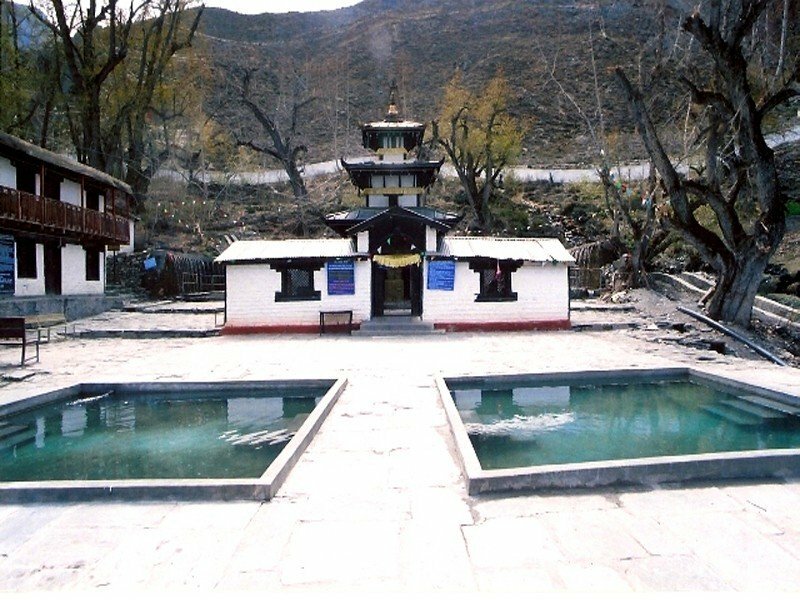 Once Pilgrimage journey made to this holy Muktinath, holy dip in the Kunda and bath beneath of 108 waterspouts “Muktidhara” is believed to bring about salvation (Moksha) and to fulfill your wishes. 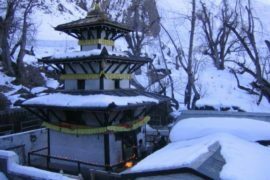 We welcome you to visit the highly religious place of Muktinath, where you will enjoy and discover you are on your special journey.